Today I had a hard time taking a few shots, the sun was shining but the wind was quite strong and the quilt was very lively. Both other photos were taken indoors and the colors are a bit different. 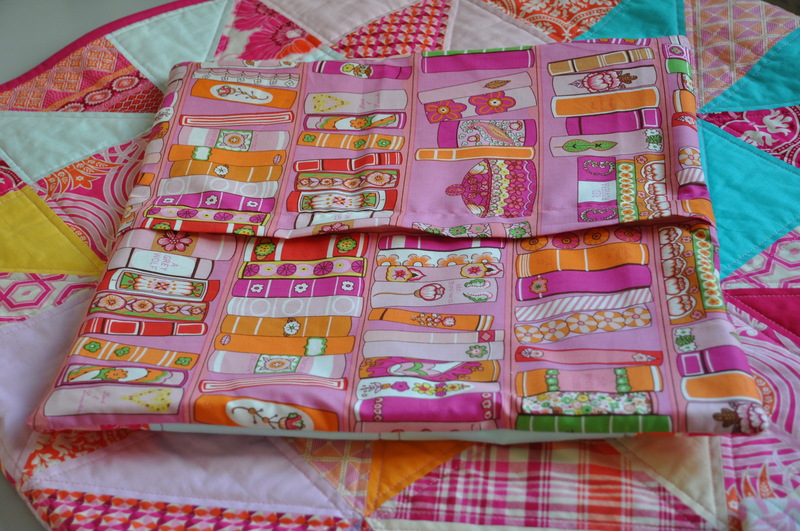 This entry was posted in patchwork, quilts and tagged block, finished quilt, pillow case. Very nice. What size is your quilt? What a happy quilt! Great combo of colors and fabrics! Thanks Janine, in 2 weeks I am heading for Prague – looking forward to that! Thanks, I love to work with HST! That is so absolutely, wonderfully cheerful. It’s what we need this time of year. Stopping by from Plum and June. Thanks for visiting my blog. I like to work with bright colors – specially at this time of year! 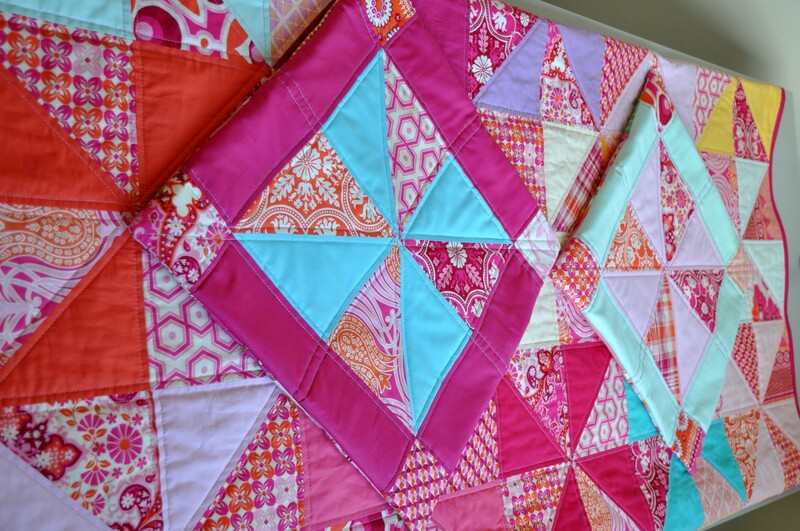 Thanks for your comment, bright colors just cheer up – also when quilting! 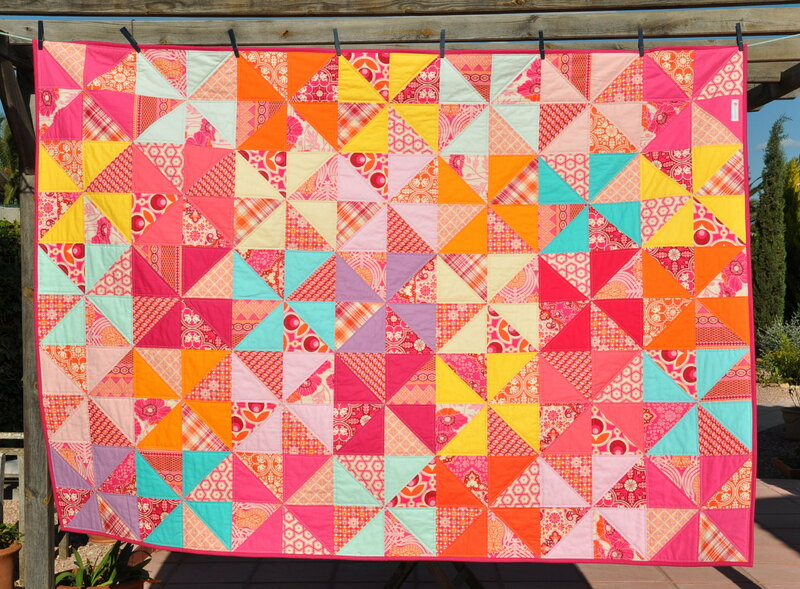 Love the pops of turquoise in with all the pinks and oranges. Thanks, actually turquoise is my favorite – I thinking now of a new turquoise quilt. Wow this quilt is stunning! I just love those fresh, bright summery colours. I can relate to photograph issues too though, the wind always blows when you least need it to!! Thanks for your comment. I am happy to hear that I am not the only one with wind blowing at the wrong time! those are very pretty! I really like the colors! Thanks a lot for your nice comment! !